Ambria Berksteiner (right) with Savannah Mayor Eddie DeLoach. 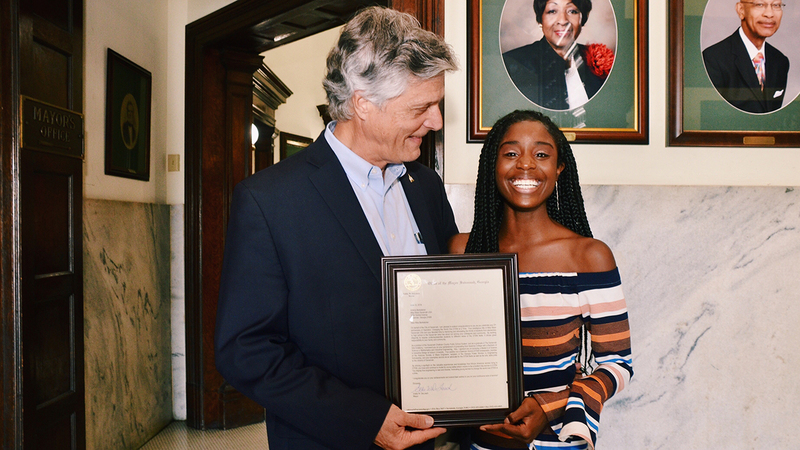 Industrial and systems engineering major Ambria Berksteiner was honored by Mayor Eddie DeLoach of Savannah, Georgia, as a leading ambassador for promoting science, technology, engineering and mathematics to underrepresented students. In 2016, Berksteiner founded Operation Changing the World One STEM at a Time Inc. to mentor young African-American girls who are interested in STEM careers. This summer, her organization held camps for elementary-age students in Savannah to promote engineering and mathematical concepts. Berksteiner is enrolled in a dual degree program in which she earned a bachelor’s degree in mathematics from Spelman College in Atlanta and is now pursuing a second bachelor’s degree in industrial and systems engineering from Auburn. She plans to pursue a doctorate in industrial and systems engineering at Auburn. In addition to being the reigning Miss Black Savannah USA, Berksteiner is an executive board member of Auburn University’s chapter of the National Society of Black Engineers and a recipient of the Georgia Power Women in Engineering Scholarship. Read more about Berksteiner and her work promoting STEM fields.